This dancing clown grins through all the horror and gore in It and exudes malevolent wit. While King’s villains are often frightening, Pennywise’s wit approaches camp without really being funny. Zach Handlen describes It as “set largely in a single small town in Maine. [W] hile it spans decades, the main action takes place in two distinct time periods. —1985, when the grown-up losers come back to finish the job they started as children. [Handlen confesses that It was…] scarier then any of the other King novels I’d read, scarier even than that time my best friend Lucas summarized the plot of Nightmare On Elm Street for me. My paperback copy was a tie-in edition with the TV miniseries, and it had Tim Curry on the cover in full clown make-up…. No wonder creepy crown sightings have troubled communities across the US and the UK of late. Facial symmetry & averageness” is lacking in some clowns. “ You’ve heard about the creepy clowns terrorizing the US. Since late summer, the craze that sees people dress up in sinister costumes has caused problems for police departments across the country. Now the trend appears to have gone global. 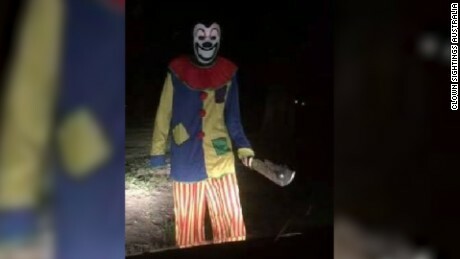 In the UK, Thames Valley police said it had responded to 14 sightings of clowns over a 24-hour period, while Cumbria police said it had received reports of nine clown sightings, including one holding a knife. But don’t let anyone tell you your fear of clowns is irrational. There are perfectly sound psychological reasons for being creeped out by these pranks. Childhood innocence vs. evil menace. Incongruence makes us feel uncomfortable. That is one of the reasons we find clowns so frightening. They are supposed to be fun, playful and reminiscent of childhood innocence. But as far back as the 16th century, Shakespearean jesters were often associated with death and darkness. This image has continued through to today in the way they are depicted in popular culture. So while we want to be lulled into a sense of childlike security with a favorite toy, we sense that something much more sinister lies behind the painted face of a clown. We are social beings and as such have evolved the ability to read themes such as safety and danger based on facial expressions and body language. Clowns hide behind masks, preventing us from seeing what they are feeling, thinking or even guessing their true emotions. A mask not only hides appearance, it hides intent, and when we are unsure of the intent of the person across from us, it makes us scared. Revulsion from contorted facial asymmetry. Researchers who study facial attractiveness note that most of what we find attractive is socially constructed: things such as skin color, eye shape and lip size. Two things that are innate are facial symmetry and “averageness,” or not having features that stand out too prominently from the norm. Clowns defy both of these — their faces are painted to be particularly asymmetrical and exaggerated, so when we look at them we have a natural aversion to them. Much of their performance repertoire depends on making us laugh and connecting with us so we find ourselves feeling a kind of cognitive dissonance between being repulsed and being engaged. As mentioned above, our culture is littered with references to evil clowns, from children’s entertainer-turned-serial killer John Wayne Gacy to Pennywise, the character in Stephen King’s It. The association between clowns and danger has been consistently reinforced over the past few decades, and as such we are more likely to adopt a view of them as being frightening because we have learned to see them that way. We naturally fear the illogical. And clowns embody the illogical. They are human enough to be recognizable but removed enough from normality to be odd and unfamiliar. So they ensure that their physical gestures are common but also grossly exaggerated: If a relatable characteristic such as a tear is present, it’s depicted as flat and comical. Because their image is distorted but still recognizable it invites us to try and understand what is really going on — we engage not necessarily because we’re entertained, but because we’re confused.